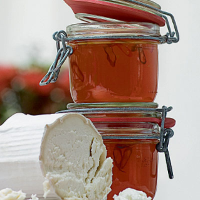 Foodie friends will love this preserve of tomato jelly infused with chillies. Place the tomatoes, lemons, the roughly chopped red chilli and 450ml water in a large saucepan or preserving pan. Bring to the boil, cover with a lid or large sheet of foil and cook very gently for 40 minutes. Leave the mixture to cool slightly. Line a mixing bowl with a large square of muslin, with the edges overhanging the sides of the bowl. Ladle in the cooked pulp and juices, bring up the edges of the muslin and tie in a bundle with string. Secure the bundle from a cupboard handle, and place the bowl underneath to collect the juice. Leave for at least 2 hours or overnight. Sterilise several jam jars or small kilner jars (see Cook's tips). Measure the juice and return to the cleaned pan, adding 325g preserving sugar for every 500ml juice. Heat gently until the sugar dissolves. Bring to the boil and stir in the sliced chillies, then boil rapidly for about 20–30 minutes, or until setting point is reached (see Cook's tips). If a layer of thick foam collects on the surface, skim it off with a slotted spoon. Leave the jelly to stand for 15 minutes then ladle into the prepared jars. Cover with waxed discs and jam pot covers and label. The jelly can be stored in a cool place for up to 6 months. To test for setting point, put a tsp of jelly on a cool saucer and refrigerate for 2 minutes. Push the edges - if it wrinkles, it's ready. If not, boil for longer. To sterilise, place clean jars in a cool oven at 150°C, gas mark 2 for 15 minutes.